This is the story of the early years of Alfred of Wessex and the fictional Eadwulf of Mercia, son of Beorhtwulf of Mercia. 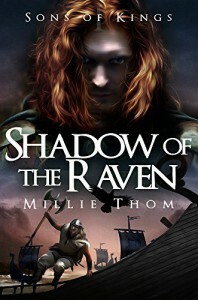 Eadwulf is 10 years when his home is attacked by Vikings, his father killed and Eadwulf taken as a slave. He learns the viking ways and in time earns the respect of his master Bjorn. Meanwhile Alfred is growing as the king’s youngest child who is already showing piousness as a 4 year old. Mature for his years, his life is also turning upside down when his mother dies. This started really slow but I’m glad I kept reading because after it started picking up it was good. Eadwulf goes from being king’s son to a slave, thrall, and becoming one of them. But he never forgot who he is or where he came from and longs to avenge his family. Alfred is so young that he doesn’t really do anything in this book but I’ll look forward seeing more about him. There’s lot of great minor characters like Bjorn and his sister Freydis and I hope we get to see some of them in the future.